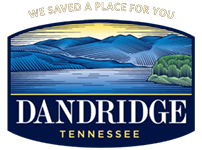 The Public Works Department is critical to the successful operation of the Town of Dandridge. Encompassing multiple departments: Building and Grounds; Highways and Streets; City Garage; Sanitation, all citizens benefit from their hard work. Each household is provided a garbage container. Each container has a serial number and is assigned to a specific address. The container is to remain at this address. If additional cans are desired, they may be purchased at a cost of $65.00 per container. A form is available for purchasing additional containers. The truck picking up the trash container has an automated arm, which reaches out to pick up the container, empties it, and returns it to its specified location. No other garbage cans can be used with the Town’s garbage truck. Garbage must be inside the 96 gallon container provided by the Town. • Monday Route: All residents east of First Methodist Church including: Hopewell Street, Milldale Road, Elmer Lane, E. Price Road, W. Price Road, E. Dumplin Valley, W. Dumplin Valley, and Cline Road. • Tuesday Route: All residents west of First Methodist Church including: Patriot Drive, Goose Creek Road, Hart Road, Jerrimac Lane, Charles Court, Danielle Drive, Delores Drive, and Killion Road. • Wednesday Route: All residents off Epco Drive. • Thursday: All pickups are made with the exception of Epco drive. • Friday: Residents of Epco Drive. • Friday: Brush is typically picked up on Friday. • Leaf pickup generally begins the last week of October. When an observed holiday falls on a Monday or Tuesday, service will resume one day late. During the week of Thanksgiving, no recycling pickup is available. Closed Thurs. and Friday. No services provided. If Christmas falls on a Sat., no services provided on Friday before. If Christmas falls on Mon., no services provided on Mon or Tues. Extra crews will run trash on Wed. to catch up.